Should You Add Career Education Corp. (CECO) to Your Portfolio? Legendary investors such as Leon Cooperman and Seth Klarman earn enormous amounts of money for themselves and their investors by doing in-depth research on small-cap stocks that big brokerage houses don’t publish. Small cap stocks -especially when they are screened well- can generate substantial outperformance versus a boring index fund. That’s why we analyze the activity of those successful funds in these small-cap stocks. In the following paragraphs, we analyze Career Education Corp. (NASDAQ:CECO) from the perspective of those successful funds. Career Education Corp. (NASDAQ:CECO) investors should pay attention to an increase in activity from the world’s largest hedge funds recently. At the end of September, 16 funds tracked by Insider Monkey held shares of Career Education Corp, which represents a jump of nine funds from the end of June. However, the level and the change in hedge fund popularity aren’t the only variables you need to analyze to decipher hedge funds’ perspectives. A stock may witness a boost in popularity, but it may still be less popular than similarly priced stocks. That’s why at the end of this article we will examine companies such as Cascade Bancorp (NASDAQ:CACB), Forestar Group Inc. (NYSE:FOR), and Ashford Hospitality Prime Inc (NYSE:AHP) to gather more data points. With all of this in mind, let’s take a glance at the latest action regarding Career Education Corp. (NASDAQ:CECO). 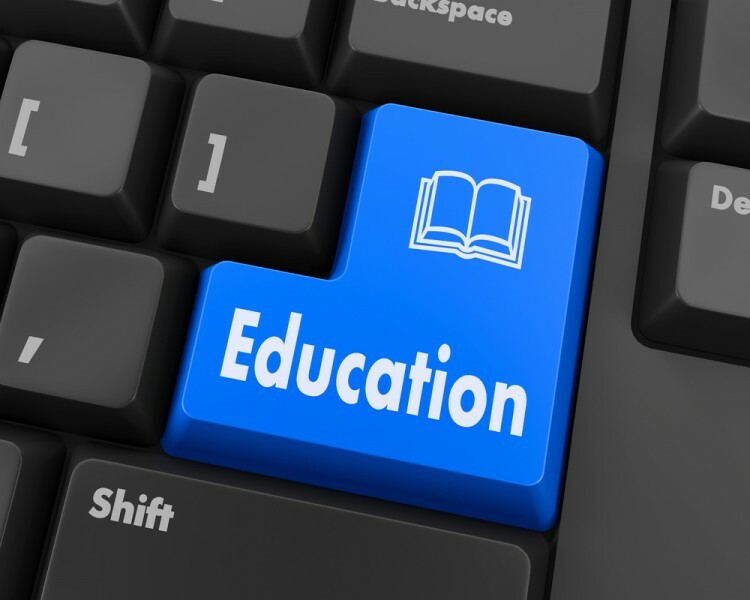 What have hedge funds been doing with Career Education Corp. (NASDAQ:CECO)? During the third quarter, the number of funds followed by us long Career Education Corp. advanced by 78% to 16. 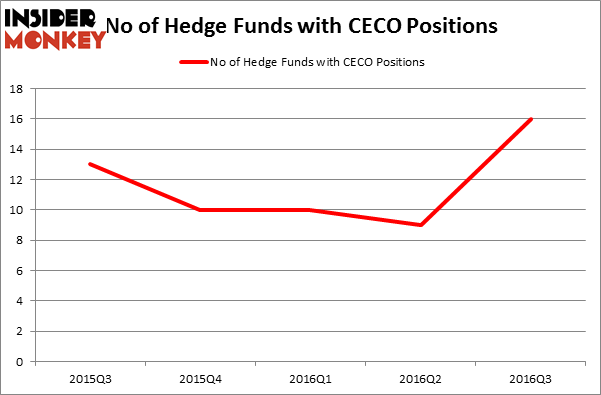 Below, you can check out the change in hedge fund sentiment towards CECO over the last five quarters. With the smart money’s capital changing hands, there exists a select group of key hedge fund managers who were increasing their holdings meaningfully (or already accumulated large positions). According to publicly available hedge fund and institutional investor holdings data compiled by Insider Monkey, Jim Simons’ Renaissance Technologies holds the largest position in Career Education Corp. (NASDAQ:CECO). Renaissance Technologies has a $26.6 million position in the stock. The second most bullish fund manager is Nathaniel August’s Mangrove Partners which holds a $18.1 million position; 4.2% of its 13F portfolio is allocated to the company. Remaining hedge funds and institutional investors with similar optimism consist of Michael Kao’s Akanthos Capital, Cliff Asness’ AQR Capital Management, and David E. Shaw’s D E Shaw. We should note that Mangrove Partners is among our list of the 100 best performing hedge funds which is based on the performance of their 13F long positions in non-microcap stocks. Is Cryolife Inc (CRY) A Good Stock To Buy? Is Cohu, Inc. (COHU) A Good Stock To Buy Right Now? Is Tobira Therapeutics Inc (TBRA) A Good Stock To Buy? Is 2U Inc (TWOU) A Good Stock To Buy? Hedge Funds Are Selling Concordia International Corp (CXRX) Is Bottomline Technologies (EPAY) A Good Stock To Buy?